With this review it goes without saying that Buchi Emecheta is one of my favourite writers. As you might have observed, you would guess I have taken on a mission to peruse all of her works. 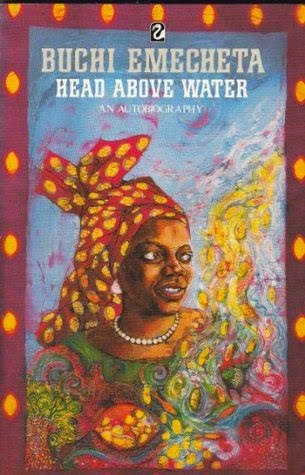 Before you read Head Above Water, I sincerely recommend that you read her first novels in the following order, if possible, at a go "In The Ditch", Second-Class Citizen, The Bride Price and the Joys Of Motherhood. Head Above Water is a non-fiction autobiography, most of her stories are, anyway. If you are used to her novels, you'll remember her father died when she was really young. As a teenager she spent most of her time (even her holidays) in boarding school. Following that, she married a man who immediately moved to the UK after leaving her pregnant twice. She had her first two children in Nigeria before she decided to relocate to the UK to join her husband who is forever a student. Her husband did not welcome her with open arms (as she has expected) instead he abused her, left her pregnant three more times before abandoning her with a total of five children. Buchi Emecheta was only 22 years old then, if not less. She lived on social welfare, brought up her children alone, went to university and became a professional writer. All at the same time, with little or no help. In fact, she succeeded in moving herself and her children up from the bottom of the ladder. Head Above Water is an enjoyable read, however, since it was an autobiography I felt she should have gone into details about her personal life. For instance, her relationship with her late daughter, Chiedu, and her subsequent death. She dedicated this book to her. However, she never mentioned what or how she died of. First of all, I am fully aware that "the death or loss of a child" will always be a difficult topic to expound on. In my opinion, however, I believe it is so significant it shouldn't be left out in an autobiography. Also, she stated that "The Joys of Motherhood", my favourite novel by the way, (and her best seller which earned her her fame) was written straight away after a tumultuous quarrel with her late daughter. Now, you may understand why I might be interested in circumstances surrounding her death. Buchi Emecheta is what I would call an emotional writer. Writing to her is therapeutic especially during those difficult days. I know she has always wanted to be a writer even before she got married and started having children. However, her "In The Ditch" days (as she calls it in Head Above Water) somewhat evoked the desire and emotion to write in a kind of way that she would not have done in different circumstances. She is a survivor and my inspirational figure. An enjoyable read that I recommend. With this I end my reviews for the year 2014. Sheesh, she's been through a lot. I agree, some things are tough to talk about, but if you decide to write an autobiography, there are some things you should be prepared to tackle. I have The Joys of Motherhood and it keeps getting skipped over since I'm not a mother. I'll check out your review on that one. Ishmael Beah will be in town next week to discuss his novel. I'm looking forward to it. Shannon you should read the Joys of Motherhood. Moreover the title is ironic. Great review, Mary. I started this book but for some reason could not finish it.Not because it was boring. Far from it. I will do well to finish it and then put my review up. Afua, now that you said so, I remember you were reading it last year, maybe that was why I got my copy too? What happened? I'd so very much like to read your review.